"The primary aim of this book is to help the reader to understand the language of music and how it works in relation to the guitar. It is not intended as a substitute for all other lines of study, but it will provide a basic knowledge that can be expanded and developed. The reader is urged to read as wide a range of books as possible and to examine whatever music he or she possesses to identify further examples of the points discussed. The examples should be played and carefully listened to. The study of music is sterile if confined to making marks on paper, no matter how well understood intellectually; no real value attaches to a theoretical study of music unless it is directly related to aural experience and its value is reduced further if it is not related to the music of one's instrument. Contents include Musical Sounds and Their Origins, The Organization of single notes, Melody, Intervals, The Beginning of Harmony-Triads, Functional Harmony and Cadences, Primary Harmony and Cadences, Primary Triads and Substitution, Modulation and Transition, Secondary Sevenths, Other Diatonic Secondary Sevenths, The Cadential Six-four, the Dominant Ninth, Secondary Ninths, Chords of the Eleventh and Thirteenth, Chromatic Alteration of Diatonic Chords, chromatic Harmony, Remote Modulation, Pedal Points, and Steps Beyond. 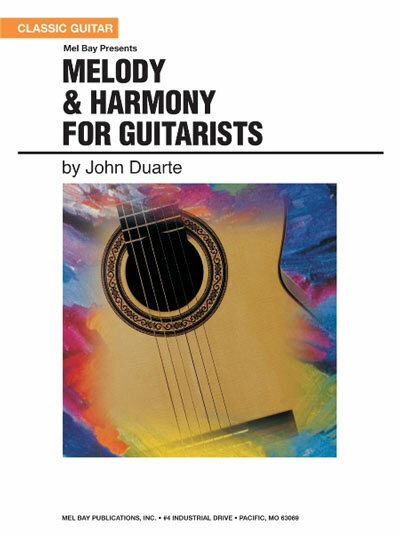 This is a fantastic book for learning music harmony on guitars. General harmony books, even the ones written by famous composers, just don't work well for guitarists. I've been struggling with applying keyboard harmony on guitars for years. I'm so glad I've found J. Duarte's book on this subject.